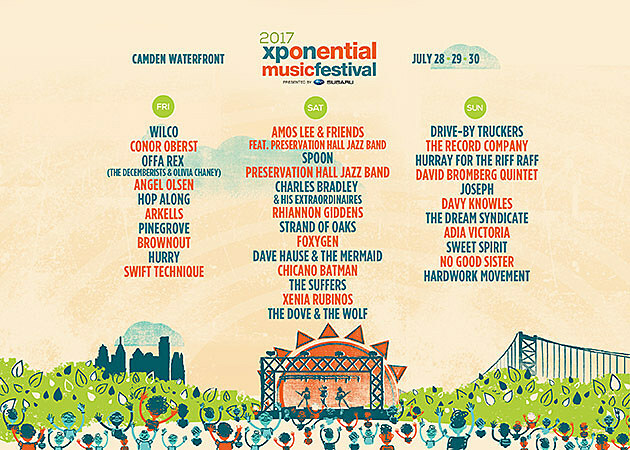 Camden, NJ’s XPoNential Fest released the initial lineup for the 2017 edition of the festival, which takes place from July 28 – 30 at BB&T Pavilion & Wiggins Park. Now they’ve added more bands, including Offa Rex (The Decemberists and Olivia Chaney), Pinegrove, Foxygen, and Hurray for the Riff Raff. They join Wilco, Spoon, Conor Oberst, Drive-By Truckers, Charles Bradley & His Extraordinaires, Angel Olsen, Strand of Oaks, Xenia Rubinos, Hop Along and others on the lineup, which you can see in full below. Three-day passes are on sale now, as well as single day tickets just to BBT Pavilion on Friday (Wilco, Conor Oberst, and Hop Along) and Saturday (Amos Lee & Friends Featuring Preservation Hall Jazz Band, Spoon, The Suffers, Chicano Batman).